Playing sport and doing exercise are a great way of keeping fit and making sure your family stays well and healthy. Playing sport together as a family is also a great way of spending some quality time together. But instilling sporting values in your children at a young age is about even more than this – it is about teamwork, a skill for life. Teamwork, of the sort that your children will learn in a sports team is something which will equip them well for their future lives in all areas of them, from social to work and everything in between. Where Does Teamwork Come In Useful? Teamwork, and the skills which make a good team player are invaluable in all walks of life. For a start, your child may decide to play sport at a higher level, in which case, they will certainly be expected to have good teamwork skills. Being part of a team is not something which only happens on the court, pitch or field. In fact, in almost every job interview your child attends for the rest of their life, they will be expected to describe a time when they have demonstrated good teamwork skills. This goes for every job, in every sector, regardless of position. This is because almost all jobs require some dealings with other people and therefore, need a certain amount of teamwork in order for everything to flow smoothly. But it is not only professional lives which need teamwork. Think of your own family life. All areas of family life need teamwork to function as well, whether it is cleaning the house or bringing up the children. The saying no man is an island may well be a cliché, but as with all clichés, it has a certain amount of truth to it. No one can function alone and everyone needs to be part of a team in some areas of life to make a true success of it. Of course, many of the areas of life cited above also need people with leadership skills as well as those who work well as part of a team. The two skills are not mutually exclusive. In fact, more to the point, they actually complement each other well. How can anyone be a good leader if they have never worked as a successful part of a team? In order to be a good leader, a person must have a good idea of how a team works and what makes a good team and a good team player. Therefore, in any area of life which requires a person to demonstrate leadership skills, they can draw on times when they have led a team or times when they have had a good leader. Again, it is job interviews when this is most likely to come up. Teamwork is not something to be taken lightly or something which you should assume is inherent in everyone. Some people naturally make better team players than others, just as some people are better leaders than others. However, this does not mean that it cannot be taught either. 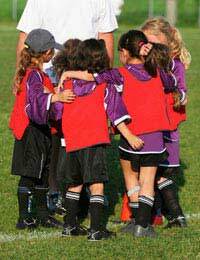 Sport is a leveller and a great way of instilling those basic teamwork skills in everyone. Therefore, if you get your youngsters involved in sport, they will pick up these most valuable skills at a very early age.